Wilhelm Wreszinski was an officer in a Kraftfahr Kolonne and wrote of his experiences in "Der Pionier", a soldier's magazine. At first the roads are frozen but as the day warms up they become a sea of mud and dirt that we sink into. The trucks have iron wheels which make driving doubly difficult. All kinds of measures are taken to keep the trucks moving forward in this mess, including the drivers putting all the bodily force behind pushing the vehicles forward. Driving a 3-4 ton ironed wheeled truck on the front line is no small achievement. Cold blood, calm nerves, a strong will and no suspicion of nervousness are the prerequisites for a driver. They need to focus their concentration and energy to make a success of their job. We move out at midday. We are to deliver troops and pick up the men they relieve, and deliver artillery shells and Werfer mines. The heavily shelled Lens-Vimy-Arras Street is luckily behind us and we are driving through Lievin to the destroyed town of Angres. From the Loretto heights the enemy can see us approaching. The observers in the observation balloons see us coming as well and their greeting soon arrives. We make for a railway embankment but this is given special treatment as the enemy suspects we have artillery hidden there. We manage to safely deliver the troops. Our first task is over. It will take time for the relieved troops to arrive so I decide we will deliver the Werfer mines. It is no nice feeling to drive through a barrage with a truckload of ammunition. On the ground there is no one to be seen. They are all under cover. The load and the barrage make for difficult driving indeed. For the driver there is no bunker, there is no trench. Without any cover, seen by the enemy during the day, heard by the enemy at night, he has to do his duty, driving along roads and paths that the enemy know already like the back of their hands. 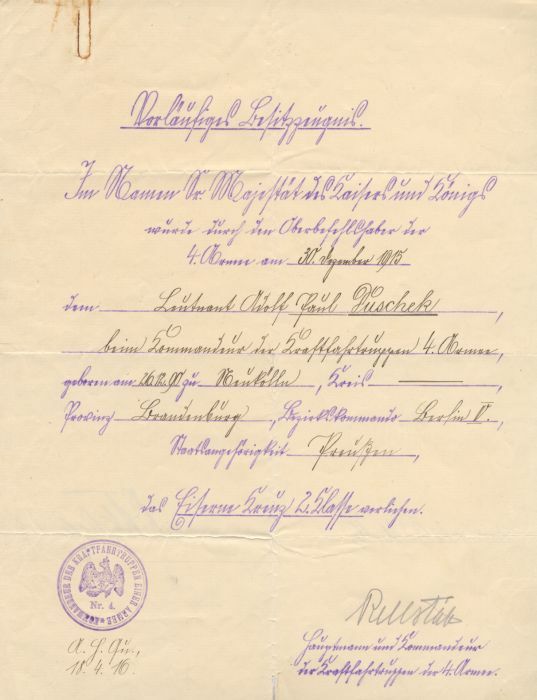 Above: An Iron Cross certificate for Leutnant Adolf Paul Puscheck, serving in the Kraftfahrtruppen of the 4th Army. 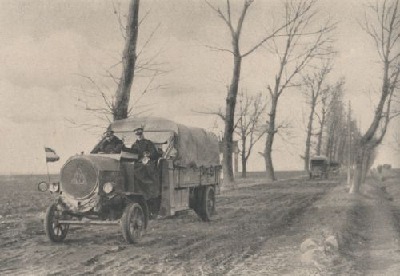 The truckers o the 4th Army had to contend with the mud of Flanders for the duration of the war. Dusk has arrived. We deliver the mines in Givency, a small town. The trucks have difficulty turning, a cm more or less and they would have landed in one of the ditches, ponds or simply got stuck in the mud. That must not happen. We still have to pick up the relieved troops and do another munitions delivery. The British are particularly lively, taking the whole area under artillery fire with explosives and shrapnel. There is a vibrant "night life" here at the front,; truck drivers, train and munitions columns, field kitchens, miners, infantry marching to and from the front. A truck never returns home empty. Each driver tries to make his truck as useful as possible. If he has no particular orders for a leg of his journey he will load up troops or equipment. But we have specific orders and want to get out of Givency as fast as possible. Suddenly there is a loud explosion and fountain of mud followed by a sickly smell. As leader of the column I am in the back lorry. I run forward to find out what has happened. Luckily all my people are safe. A 15cm shell has landed leaving horses and carriage drivers in a large pool of blood. The other horses panic and break loose, taking their wagons with them, causing a Sanitätswagen coming in the opposite direction to tip over. The horses are tangled up blocking the road. Already the truck drivers are arriving, releasing the horses and leading them from the road, moving the wounded from the road and binding their wounds, pushing the wagons from the road. The shell has cratered the road and the men search for rocks and wood to fill it so we can drive past. Night has fallen, only the occasional flare lighting up the area for a few seconds making the work more difficult. Soon we are ready to continue. Once again, the only light is that of the flares. Ahead of each truck walks a man with a white panel on his back to check the road. The drivers follow. Any light here would be a death sentence. What is it like to drive at night, without light where you can barely see your hand in front of your face? Only those who have tried will know. Other than the real dangers the mind plays tricks. The tired men seeing things in their paths that do not exist. We pick up the infantrymen and bring them to the rear then drive to pick up ammunition for our second trip. We seldom do only one trip a night. It is a routine. If all goes well, there are no incidents along the way, if no truck sinks in the mud or falls into a shellhole, which is not uncommon, then we may be lucky enough to arrive home at 6 A.M. after 12,15 or sometimes 18 hours of work. Then 6 hours sleep, then maintenance of the vehicles until the next orders, the driver had little free time. It was no easy task to drive a heavy truck on bad roads under enemy fire. Especially difficult was delivering to new positions at night; we spent many, many hours crawling on all fours along the ground, feeling our way to avoid the trucks falling in a trench or hole. And then the work when a truck DID fall in, or broke down, or broke an axle... Then it was time for cursing and sweating. The repairs could well be done in sight of the enemy and the truck be used for target practice by his guns. Often the driver and co driver would have to unload heavy ammunition from the truck on their own so at least that was safe, then do the repairs and reload the ammunition. What would have happened if the trucks had failed and the ammunition and fresh troops had not arrived on time! Failures or delays had to be avoided as the outcome of a battle could sometimes depend on minutes.